Derry forward Eoin Bradley says he will continue to play for Coleraine in the Irish League and will miss the GAA's McKenna Cup competition. The McKenna Cup is seen as a warm-up event during which county managers experiment before the League campaign. Glenullin club man Bradley, 29, said he had still to decide between playing for Coleraine or switching to Gaelic when the league starts in February. "I am concentrating on Coleraine and I am enjoying it," said Bradley. Eoin Bradley says he has yet to decide between Irish League and Gaelic football. Recently Derry manager Brian McIver ruled out any possibility of Bradley playing both codes when the GAA county season resumes. Bradley said he understood the stance taken by the Oak Leaf boss. "I have spoken to Brian about it and I suppose when National League time comes he will be looking for me to play the Gaelic. "Coleraine manager Oran Kearney has given me a bit of leeway. I was wanting to play both, but Brian doesn't see it that way. "So I will just play it by ear and see what happens, but I can see where Brian is coming from. "I am enjoying playing for Coleraine and everyone at the club has made me welcome. "I will not really know what I am going to do until January or February. "I will chat is over with my family and decide in the next week or so." Bradley joined Coleraine just before the transfer deadline early in the season, signing from Championship side Ballymoney United. 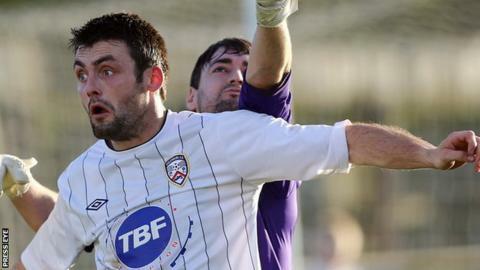 He has scored five goals in nine appearances, although the Bannsiders slipped into the bottom three in the Irish Premiership by losing 4-0 away to Coleraine last Saturday.